Join the discussion on our forums! Come discuss Adaptation over in our dedicated Adaptation discussion topic. This is better than Windfury, equal to Blessing of Might, Hand of Protection and worse than Divine Strength, Lost in the Jungle (Battlecry>Deathrattle and does not summon Silver Hand Recruits) and Barkskin. Poisonus is worth 1 mana (Emperor Cobra and River Crocolisk), Taunt and 'Can't be taget by Spells or Hero Power' are 0.5 mana worth. Team 5 Nobody: "Guys, nobody takes Hearthstone seriously from how random it is, what should we do to fix that?" Ben: "We need an entire expansion of cards that pull 3 random results that vary from overpowered to useless"
So this card could provide Paladin with two new board clears? Adapt (poison) + Wild Pyromancer and Adapt (poison or +3 attack) to Sergeant Sally. an inconsistent hand of protection. TRASH. Wild Pyromancer + Adaptation's poison = cleared board. Toast Bless. Well, yeah but if you have no other options it's a way out. 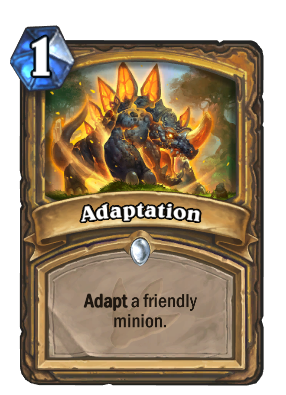 Also it's 30%, you get 3/10 adapt cards to choose from. Does that work? I thought Wild Pyromancer and a spell card was just like a whirlwind effect, would have to see a video on this one. Ok so, we got a new sorcerer's apprentice for priest, if by chance we manage to get either it or the original apprentice and play a Murloc champion, the new card that returns any buffs used on it to your hand, you literally have a 0 mana adapt buff that can be used on it as many times as you can manage in a turn. I dun know bout you guys but i already have a dream for this expansion XD. Edit; Alas, i just realized the return spell to hand of primalfin champion is a deathrattle, rip ze dream XD. This card is very important, because it without a doubt establishes what mana adapt is worth. Blessing of Might power creep? If you specifically WANT +3 attack, it's worse since you might not get it, but otherwise it can be better, depends on if you think Blessing of Might is on the top 4 potential or bottom 6. Same can be said for Hand of Protection.